Spike Spencer has been a voice actor since the early nineties. He has voiced hundreds of episodes of Anime including such notable titles as Evangelion, Vampire Knight, Battle Angel, Suikoden, Orphen, Spriggan, Nadesico, Mar, PreTear, Buso Renkin, Code Geass 2, and Bleach. His video game credits include World of Warcraft: The Burning Crusades, Tales of Vesperia, Steambot Chronicles, Star Ocean 2, Lunar: Silver Star Harmony, BlazBlue and many others. Spike has also lent his voice to numerous radio and TV commercials. An accomplished actor, he has worked with such notable stars as Tommy Lee Jones, Sandra Bullock, Frank Langella, Tia Carrere, and Scott Glenn and has been on set with many other stars. Spike is also an author, including "How to Be A Frickin Genius Voice Actor, Step One," "What Happens At The Con, Stays At The Con?," And "Don't Kill Your Date (And Other Cooking Tips)"-(Coming soon). 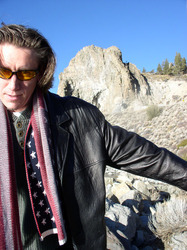 Spike is also a screenwriter with several projects in various stages. Spike is soon to begin production on his first feature film that he scripted, "Dwindle Down."